Pirelli Scorpion Verde All Season Plus converts into additional miles, a quiet ride and assured safety. The Scorpion Verde (green in Italian) is “opera” in full swing for all seasons because it is eco-friendly, as the name indicates. The engineers designed the Scorpion Verde to provide excellent handling of the vehicle in all weather conditions. The Scorpion Verde All Season has the capability to negotiate comfortably on both wet and dry road surfaces in all seasons. The tire has good traction in light snow. Made from a silica tread compound with its refined asymmetric tread design, the Scorpion Verde All Season Plus offers superb dry road traction, even wear, great control and increased tire life. 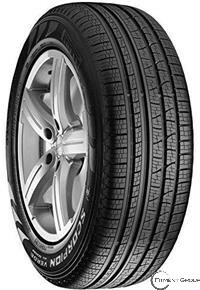 The four wide circumferential grooves allow for hydroplaning resistance on wet or snowy road conditions.